Translation and recording of videos from English into other languages can become challenging as English uses fewer words than most other languages. The translated text must be short so that recordings can match the length of the English language video. That process often requires rephrasing or paraphrasing to get it just right. If the purpose of the video is to explain a product or to instruct the viewer to follow a certain process, that can be even trickier. The translated text must be as short as the English and must also follow the instructions as seen on the video. The window in the white pen body should show a “1”. With your other hand, slowly turn the white pen body several times in the direction of the arrows until you see a “2” in the window and hear a click. When the English voice says ‘1’ and ‘2’, the number ‘1’ and ‘2’ are shown on the white pen in the video. The translated text must have these two numbers at the exact same time as spoken in English so that it matches the English audio in the new language. Even the sound of the ‘click’ at the end of the sentence requires that a clicking sound be made on the new recording at the end of that sentence. Such a process can be challenging and requires that the translator be able to access the video to time the translation correctly for recording. It also requires that the translator be trained in audio translation and in paraphrasing sentences so that sync points match in the translated script. It further requires that the voice talent has experience in recording ‘to picture’, i.e. watching the video at the same time as he or she records and it requires a professional coach and audio engineer to make sure that the outcome is perfect. 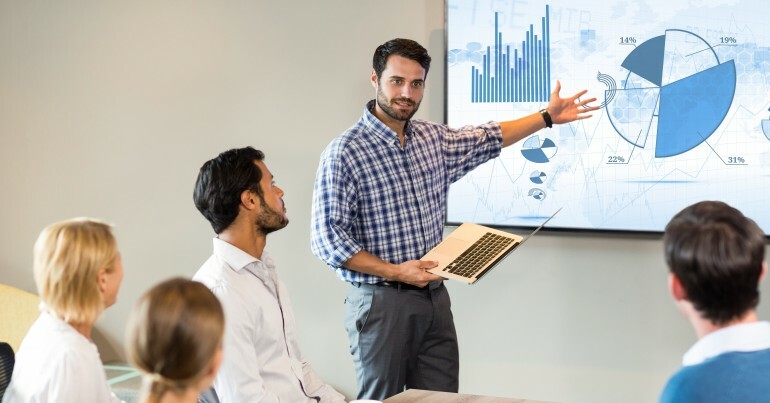 The next time you have an instructional video project or a PowerPoint presentation with charts where the moderator explains certain items on the chart or points a laser to it, let us help you match the recording accurately.